Smartphones can perform so many different and varied tasks that they have become vey shareable devices. But with the amount of personal information we store on them, sharing a smartphone can be a nervy thing to do. You might be fine handing your phone to a co-worker in the office to the check that Word document you’ve been working on, or giving it to your kids for a game of Flappy Bird on a long car journey, but all the while you know that they’re only a couple of misplaced screen taps away from your emails or Facebook app, or from buying more expensive games from the Play Store. Lollipop has a couple of excellent features for privacy that safeguard against this, and restrict what someone can do with your phone when you hand it to them. One is called Guest Mode, which is an extension of the User Accounts feature first introduced in Android 4.2 but only available on tablets; the other is called Screen Pinning, and that’s the one we’ll explore here. 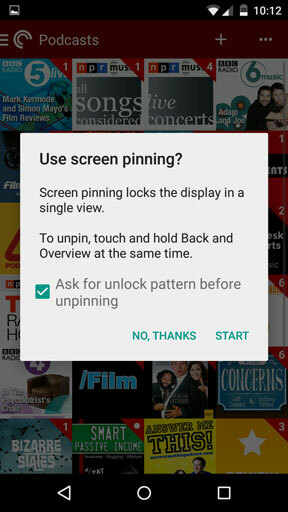 The idea behind screen pinning is simple. 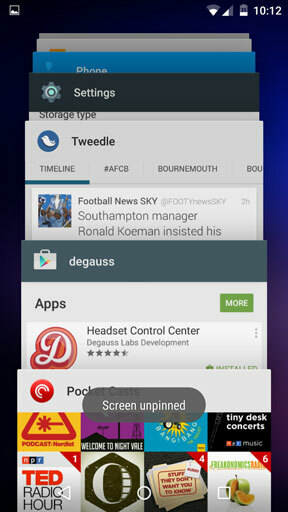 You literally ‘pin’ a single app to the screen, and that app takes over the entire device. 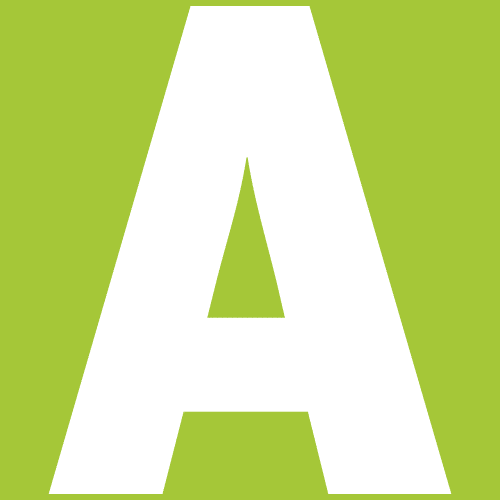 The user cannot exit the app and click elsewhere without either a combination of button presses or entering your password. It works with any app. So, you can load up Flappy Bird, pin it to the screen and then know that your kids won’t be able to do anything other than play that single game. Or load up the phone app, pin it and give it to your colleague while they make a call. 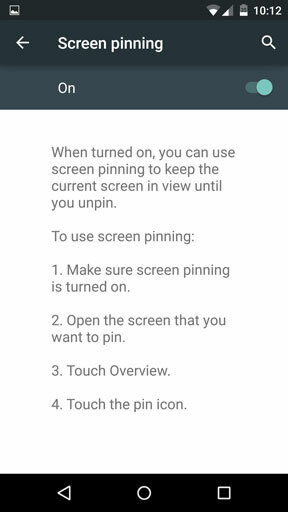 Screen pinning is a brilliant feature that discretely handles any of the privacy concerns that arise when giving your phone to someone else to use. Let’s take a look at how to get it working. Screen pinning is off by default, so needs to be activated. The setting is found in Settings > Security. Scroll down and tap the Screen pinning option then tap the slider to turn it on. Now exit back to the home screen. You pin an app to the screen via the Overview button (formerly know as the recent tasks button, it is the square icon on the navigation bar). However you can only pin the last app that was open, so you need to open the app you want to pin first. 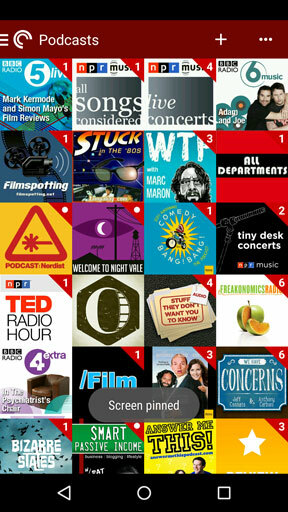 With the app open hit the Overview button to see all of your recently opened app, with the current one at the front. Swipe upwards and you’ll see a pin icon alongside the current app. Tap this icon. You’ll now be prompted to pin the app. Simply tap Start to do so, or tick the Ask for unlock pattern (or password etc.) for some extra protection. The app will now be pinned to the screen. You can fully work within the pinned app, but any attempt to exit it will tell you that you need to unpin the app first. To unpin an app pinned to the screen tap and hold the Back and Overview buttons at the same time. It takes a couple of seconds to work, and you’ll be moved back into the Overview screen from where you can hit the Home button and return to the home screen. If you chose the extra layer of security and required the password to be entered to unpin a screen, holding the Back and Overview buttons will throw you out to the lockscreen. Screen pinning is a very simple feature but incredibly useful. It protects you privacy and security, and enables you to let someone else use your phone without feeling the need to hover over them to see what they’re doing. And if you need to give someone access to a wider number of apps you can use Guest Mode instead.